By the end of the Cold War the goal of Soviet military strategy in Europe was a quick victory over NATO in a nonnuclear war. The Soviet Union would attempt to defeat NATO decisively before its political and military command structure could consult and decide how to respond to an attack. Under this strategy, success would hinge on inflicting a rapid succession of defeats on NATO to break its will to fight, knock some of its member states out of the war, and cause the collapse of the Western alliance. A quick victory would also keep the United States from escalating the conflict to the nuclear level by making retaliation against the Soviet Union futile. A rapid defeat of NATO would preempt the mobilization of its superior industrial and economic resources, as well as reinforcement from the United States, which would enable NATO to prevail in a longer war. Most significant, in a strictly conventional war the Soviet Union could conceivably capture its objective, the economic potential of Western Europe, relatively intact. In 1960 General A. Gastilovich suggested a rather simple "concept of conducting initial operations under conditions of the Eur:opean Theater". According to this concept a powerful retaliatory nuclear strike with weapons of megaton yield is launched at the beginning with the aim of putting two or three NATO countries out of the war. Following this, ground troop operations would be developed which mopped up the remaining enemy forces and occupied enemy countries. To conduct such operations, in the opinion of the author, not more than 30 to 40 divisions would be required. The concept indicated, "to the same degree, with certain corrections for geographical conditions, can also be applied in other theaters". In short, the substance of war in the concept of General A.Gastilovich boiled down to border engagements of the opposing sides with a subsequent unimpeded advance of Soviet troops onto the territory of the enemy. Gastilovich proposed, for the conduct of initial operations in the European theater of military operations, to have small number of various divisions (within the bounds of 30 to 40), organizationally represented by two fronts of 15 to 20 divisions each. the swift breakthrough of defense subsequent to nuclear strikes will be the basic content of offensive operations. Moreover, the offensive itself, as opposed to past wars, will be conducted in separate areas, at high tempos and with wide use of airborne troops and transport of troops by air. After the fall of N.S.Khrushchev, by the mid-1960s, such a point of view on the nature of armed combat did not appear conform to modern reality. Rather, a future war unleashed by an aggressor against the Soviet Union would inevitably become a world war between the two contending social systems of the world. The basic means of waging	the	war would undoubtedly be nuclear/missile weapons, and the theater of military operations would be the entire globe. Therefore, it would be naive to think that such a war between coalitions of countries possessing tremendous military-economic power can be concluded by a "blitzkrieg", with one strike. It would be, without doubt, an intense, hard, and exceptionally fierce war with decisive political and military objectives. This is the kind of war for which the Soviets sought to prepare their armed forces in order to ensure the security of the Homeland. In the 1970s, Soviet nuclear force developments increased the likelihood that a European war would remain on the conventional level. By matching the United States in intercontinental ballistic missiles and adding intermediate-range SS-20s to its nuclear forces, the Soviet Union undercut NATO's option to employ nuclear weapons to avoid defeat in a conventional war. After the United States neutralized the Soviet SS-20 IRBM advantage by deploying Pershing II and cruise missiles, the Soviet Union tried to use its so-called "counterdeployments" of SS-21 and SS-23 SRBMs to gain a nuclear-war fighting edge in the European theater. At the same time, the Soviet Union made NATO's dependence on nuclear weapons less tenable by issuing Warsaw Pact proposals for mutual no-first-use pledges and the establishment of nuclear-free zones. The Soviet plan for winning a conventional war quickly to preclude the possibility of a nuclear response by NATO and the United States was based on the deep-strike concept Soviet military theoreticians first proposed in the 1930s. After 1972 the Soviet Army put deep strike into practice in annual joint Warsaw Pact exercises, including "Brotherhood-in-Arms," "Union," "Friendship," "West," and "Shield." Deep strike would carry an attack behind the front lines of battle, far into NATO's rear areas. The Soviet Union would launch simultaneous missile and air strikes against vital NATO installations to disrupt or destroy the Western alliance's early warning surveillance systems, command and communications network, and nuclear delivery systems. Following this initial strike, the modern-day successor of the World War II-era Soviet mobile group formations, generated out of the SGFs in Eastern Europe, would break through and encircle NATO's prepared defenses in order to isolate its forward forces from reinforcement. Consisting of two or more tank and motorized rifle divisions, army-level mobile groups would also overrun important NATO objectives behind the front lines to facilitate the advance of Soviet follow-on forces, which would cross NSWP territory from the westernmost Soviet military districts. The Warsaw Pact countries provide forward bases, staging areas, and interior lines of communication for the Soviet Union against NATO. 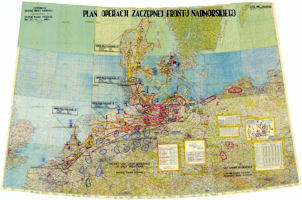 Peacetime access to East European territory under the Warsaw Pact framework has enabled the Soviet military to pre-position troops, equipment, and supplies and to make reinforcement plans for wartime. In the 1970s, the Soviet Union increased road and rail capacity and built new airfields and pipelines in Eastern Europe. However, a quick Soviet victory through deep strike could be complicated by the fact that the attacking forces would have to achieve almost total surprise. Past Soviet mobilizations for relatively small actions in Czechoslovakia, Afghanistan, and Poland took an average of ninety days, while United States satellites observed the entire process. Moreover, the advance notification of large-scale troop movements, required under agreements made at the CSCE, would also complicate the concealment of mobilization. Yet the Soviet Union could disguise its offensive deployments against NATO as semi-annual troop rotations in the GSFG, field exercises, or preparations for intervention against an ally. The Soviet Union and its Warsaw Pact allies intended to carry out a large-scale blitzkrieg aimed at seizing most of Western Europe. The goal was to break through the NATO front line and to "rapidly advance into the depth of its defense with access to the operational field." In order to quickly achieve success at the initial stage, the Soviets planned to create a numerical superiority of five to one or even six to one on the main lines of attack. The purpose of the operations was different depending on the front. For example, after the exchange of nuclear strikes, the Czechoslovak army was to break through the front line of NATO and quickly seize Nuremberg, Stuttgart and Munich, which were in West Germany. By the ninth day of the conflict, the Czechoslovak army (probably, not without Soviet support) had to take Lyon in southern France. After that, Soviet reinforcements were to advance to the Pyrenean Mountains, which formed the border between Spain and France. It was assumed that at the same time Polish and Soviet troops would capture most of the north of the continent. Specifically, their task was to invade West Germany, Denmark, Holland and Belgium. Capturing these areas was crucial to prevent the United States, Canada and the UK from planting reinforcements for NATO in northern Europe. Thus, they hoped to take control of Denmark in a week, and reach the Atlantic coast 14 days after the start of hostilities. Spain came to be commonly referred to as a "European redoubt," a relatively invulnerable sanctuary, wherein forces for use on the Central Front could be marshaled, from which air and sea attacks on the Warsaw Pact could be staged or launched, and in which a defeated NATO force could regroup for counterattack. The territory of Spain constituted an extensive land mass in the hinterland of a Europe whose fronts are dangerously narrow, an area which could serve as a platform for launching armed forces in a wide arc stretching, by land and sea, from the British Isles to the Italian peninsula. This capability to launch armed forces derives from the nature of its coasts which provide beachheads that have frequently been used by other Europeans fighting for supremacy in Europe. The Iberian peninsula provides NATO with the capacity for "defense in depth." Spain's strategic position is enhanced by its considerable distance from the airfields of the Warsaw Pact states and its natural barriers to an invasion. Unlike France, which also has both Atlantic and Mediterranean coastal areas, Spain is shielded behind formidable mountain barriers. In the north, the Pyrenees and the Cantabrian Mountains bar the overland route from Europe. Such a strategic redoubt could serve NATO as a staging point or as a base for military operations over Mediterranean Sea, Atlantic Ocean, into land mass of Europe itself, or even into Northwest Africa if it was necessary. In the event of calamity, Spain can be made a stronghold in whose expanse of land and numerous ports and airfields refuge could be found to reorganize and rebuild offensive strength from the remnants of NATO's European forces and U.S. reinforcements. So pervading and tangible was concern for the forward defense strategy that it cannot help being a factor in the thinking of every European north of the Pyrenees when the term "Spanish redoubt" is mentioned.